Most employers will never have to face an OSHA inspection. If you do, it’s important to respond in an appropriate manner. As a government agency, OSHA wields a lot of power. This includes the right to levy large fines. But you also have rights. Knowing what to do during an inspection will help protect them. It can also help avoid civil citations or possible criminal liability if there has been a fatal accident. When an OSHA compliance officer shows up at your door to announce an inspection, you have the right to do two things. One is ask to see his or her credentials. The other is ask about the reason for the inspection. OSHA can perform an inspection for many reasons. A worker filed a complaint about a work site hazard. An accident occurred that resulted in a fatality or three or more workers needing medical treatment. Or, the inspection may be part of an OSHA program to deal with a workplace hazard. In any case, OSHA must have probable cause and must explain the reason for the inspection. If it involves a complaint, you are entitled to a written copy of the complaint. 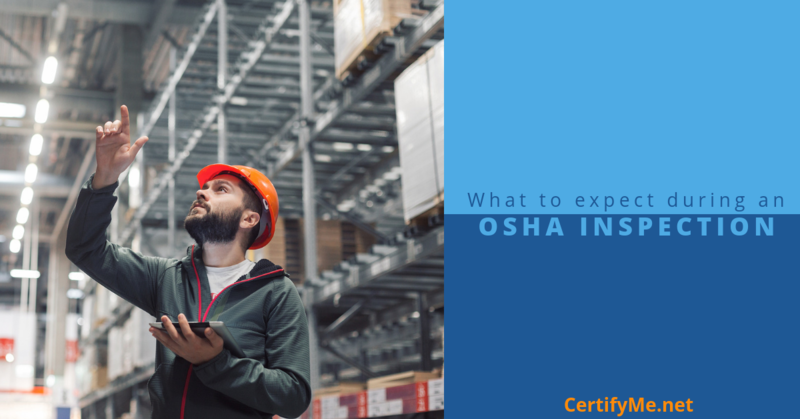 If the inspection has to do with an OSHA program, the officer must provide information about it. OSHA must allow a “reasonable” amount of time for your team to plan its response. In return, you must let OSHA know that you intend to do it. After making a decision, let the inspector know whether you will allow the inspection. If not, OSHA will need a search warrant to proceed. Before deciding whether to allow the inspection, consider whether OSHA has probable cause. Does the hazard stated in the complaint exist at your worksite? Is the data about the hazard correct? Did the accident involve your business? Are the facts of the accident listed correctly? Is the scene of the accident scene intact or has it changed? Does your business meet the criteria for the program inspection? Do you have a valid basis for challenging the inspection? Answering these questions will help determine whether OSHA has a legal right to conduct the inspection. What Will the Inspection Involve? Otherwise, a broader inspection can put you at risk for citations that aren’t part of the probable cause. Do I have to provide documents to OSHA? Yes. These can include your Federal Employer ID number, OSHA injury and illness logs, written programs, and training records. Can I limit the scope of the inspection? Yes. To protect your business, know the scope of the inspection. Then limit access to areas within that scope. How does OSHA decide on the amount of a fine? Willful. OSHA can fine up to $129,336 for each willful violation. Serious. This carries a mandatory penalty of up to $12,934. Other than serious. Penalties may reach a max of $12,934. Repeated. Up to $129,336 for each repeated violation. What are my options if I receive a citation? What happens at an informal conference? OSHA will provide an in-depth explanation of the violation, the standards cited and how to correct the violation. Is it possible to beat an OSHA citation? The best way to defend against OSHA inspections is to avoid them in the first place. If you do get inspected, know your rights. Know what OSHA expects of you. Don’t provide access or information not related to the violation. In the meantime, visit Certifyme.net to get your staff trained and certified the fast, affordable way.